I have read the new web page featuring the policy and services for guests with cognitive disabilities – new since October 9, 2013 – several times now. Each time, there are parts of this page that get my heart pumping, my blood boiling, and literally result in trembling hands due to the sheer indifference of the real struggles for individuals with cognitive disabilities. In my case, the journey has been focused on autism, but our entire community recognizes that there are many variables and deserving people that share similar needs for accommodations. We exclude no one, perhaps, because our entire journey has become a lesson in patience, endurance, compassion, and admiration for the differences present in our communities. This does not seem to be the case for Disney; as so many of us truly have a Disney disability grievance since the GAC changes took effect last week. Now we have a petition that Kim McClain is trying to deliver. She’s made multiple attempts and no one at Disney HQ wants to accept the printed signatures. We have big media reporting commentary from Disney staff members that emphasizes they are working to provide the necessary accommodations, yet individuals report throughout all platforms of social media that they have been met by opposition, split-second judgments, and unwavering policy adherence – despite parent pleas for help and improved accommodations. Whom should an individual believe – the vague PR-speak of this seemingly cold corporation or the resounding anecdotal evidence alive & thriving on the internet today? FYI, most of us special needs parents are all too familiar with visual schedules as a strategy. I’d like to know how we can predict the development of a reliable routine without the ability to schedule times at multiple rides? Your provided example #7 “Have some fun!” simply won’t cut it with children used to an itemized and predictable list of specific events. #8 “Get your favorite snack,” doesn’t necessarily bring the greatest vibes either – especially if your kiddo is on a strict diet due to milk protein, gluten, and food dye allergies like mine. Oh, and please never show a photo of a park food that any child with photo allergies may be restricted from. You’d be better off showing a photo of plain fruits or vegetables – for something as simple as this photo reminder of an appealing food that an individual can’t have may become a trigger for anyone struggling with both cognitive disabilities and allergies. There are A LOT of children on the autism spectrum that also possess food allergies to a wide range of foods! I have an idea, why doesn’t Disney provide some realistic videos about the whole City Hall experience? This is where so many of us are met with judgmental opposition, long wait times, crowded spaces, and high frustrations! How about a video that features some judgmental park visitors muttering a stream of negative statements about your child’s non-obvious disability with total lack of regard for how their misunderstanding further elevates an individual’s sensory overload? Oh, let’s also see a video that shows rude cast members expressing doubt or attitude for your child’s disability since autism can’t always be seen, or diagnosed, at a glance. It generally takes several professionals of various medical disciplines to officially diagnose an individual with cognitive disabilities. These types of videos would be much more meaningful for our children than your standard issue Meet the Cast Members and Disney Characters. My question on this suggestion is where can I find a map that’s been updated with the official kiosk locations? Many of us would like full details before we even considered a trip and far too many rumors online suggest there are only three kiosks throughout both Disneyland parks. If this is true, it is not nearly enough to help those individuals that also cope with co-morbid disorders affecting mobility and endurance for physical exertion. How are we to manage the additional physical stress of returning to far away kiosks between every ride?! Why must these individuals, who once had the ability to wait at alternate entrances that were away from the overwhelming line crowds, now return to the regular line queue. This new process is very difficult and distressing for our cognitively disabled family members! Wait, are you kidding me?! Now I gotta say that this one got me really riled up. Where does one go to practice waiting in line with the same potential for sensory overload as a Disney Park? Our entire journey has been a lesson in waiting – waiting for words and skills and focus and medical diagnoses and therapies and sometimes even compassion. A successful trip to the grocery store took two years of practice. We’re still working on tolerating warehouse-style stores like CostCo – despite our constant hard work and PRACTICE our son still struggles with wait times beyond 15 minutes for an exciting activity as well as crowded spaces. Despite our hard work practicing a Stay with Me program for the past four and a half years, our son still has a tendency to bolt and run when he becomes overwhelmed. Disney needs to recognize that there is only so much preparation and tolerance that can be managed ahead of time. Safety bracelets, nametags, and ear plugs/headphones are standard issue for many of us. Some of us even have GPS locators for extra safety from elopement. 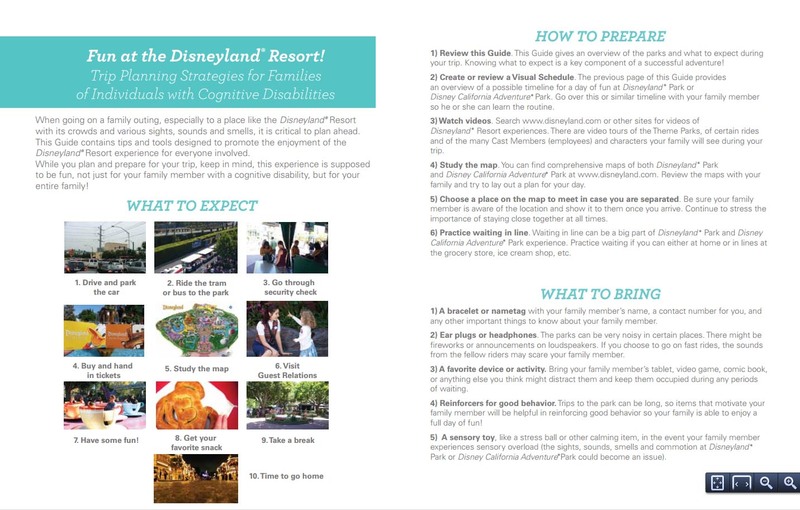 Here are some thoughts on the suggestions within this segment of Disney’s guide. Do you realize that many parents must spend thousands and thousands of dollars on out-of-pocket medical and therapeutic services? This makes a device, like an iPad, a little too precious to risk losing or breaking just to pacify an individual that must now endure and indifferent and unfair policy that does not accommodate their needs. Many of us are reinforcement and distraction ninjas and most of us come to the parks with a full arsenal of preferred activities, comfort items, and sensory manipulatives. I’ve even brought GAK and I’ll tell you right now that no simple sensory toy, like your suggested, “stress ball,” is going to avert a meltdown triggered by sensory overload! The new policy does not permit the needed accommodations to reduce the likelihood of sensory overload – brought on by crowded spaces, long waits, traveling through crowds to return to your special kiosks – time and time again. Seriously, whoever wrote this part of the guide needs to spend some extended time with a professional Occupational Therapist to learn how devastating sensory dysfunction can be for so many with cognitive disabilities. This suggestion is pure insult! I don’t know weather to cry, laugh or scream! The three times we went to Disneyland are a bright memory in my son’s memory. The first time we went – he jumped off Mr. Toads Wild ride before it started. For some reason this made the whole ride shut down. They had to pull people off of the ride that were in the process and restart the ride.Yes as my child melts down due to not understanding why he has to get off the ride, everyone in line looking at my family! Argh! It was hard enough to just to deal with all the stimulus even if it was fun. We were planning to go to Disney world this summer put without the disability passes – we may not go at all or go to Orlando and go to all the other parks in the area! I know if the real Mr. Disney was alive this would not be happening. I hope that the Disney Corporation has a change of policy or they will see and hear from those who cannot always speak for themselves! When waking up to, what I thought was, a wonderful Saturday morning; a serious matter was brought to my attention. My wife came down the stairs and told me about an email she had received. The email was in reference to a new policy that would impact accessibility to rides for those with developmental disabilities. Walt Disney World would begin implementing this new procedure in the near future (October 9,, 2013 is the tentative date). This was alarming, and rather unwelcomed. I now have to reexamine the relationship that my family would have with Walt Disney World. At the beginning of Summer 2013 a story was printed referencing those who “rent” disabled people and bring them to Disney World to cut the lines, claiming this is how the “1% do Disney.” Well as a Christian all I can say about them is that God will deal with them; however, why should Disabled America suffer from the actions of those who feel entitled? This new policy would regulate the ability of those who are disabled in being able to access the rides. Of course, Disney is explaining that it is just like a fast pass; however, I disagree and believe this is appalling. My oldest daughter is 10 years old and has Autism. Giana, my daughter, does not have the high functioning level of Autism. She is significantly afflicted, and this disability causes a disruption to her entire life. She cannot talk, complete the simplest of tasks, communicate, etc….. The only joy she gets in life is from 3 things: one is sitting in her room watching YouTube of Disney rides, two is swimming, and three is Disney World. She would never be able to wait for “Fast Pass,” otherwise we would do that. This is the only thing this child enjoys in her life. So much so, that we have relocated from New York to Florida just for Disney World. We go there on a bi-weekly basis! She has her challenges at times; however, it is really the only joy she gets. I have seen many families with children like mine who I know, from experience, will not be able to wait for specific times etc…… Shame on Disney World! When my wife told me I was first confused, then angry, then in disbelief. I cannot believe a company of Disney’s stature would even entertain such a ridiculous idea. They obviously do not have experience dealing or supporting someone with a challenging or life altering disability. If they had they would have realized that this idea is absolutely out of the question. I have been a professional of those with Developmental Disabilities for the last 14 years ranging from: direct support, management, administration, Special Education teacher and most important parent. I can confidently say, after working with a wide range of disabilities, that this is an unfeasible and almost punitive reaction to those with disabilities because Disney cannot police a system that works when utilized correctly. There could have been other options such as having a guardian or worker show some sort of identification to prove a relationship to the disabled individual. For example last names, pictures, identification badges for an employer (if they are a service provider). Another idea is to have Disney deal with such matters in advance. Many people know when they are coming to Disney, and can contact them in advance for support. Disney could employ a small division that could be responsible for just this. I find it difficult to believe that with all of the creativity, genius, and dedicated cast members this is the best that they can do. I invite any Disney member, or anyone they can get in the planet, to test this “new” approach with my daughter and see how she does. Let’s see how many melt downs she has when she cannot go on the ride she wants at the time she wants it. The point is there are other alternatives to punishing an entire group of people because of some irresponsible few. Those with Developmental Disabilities cannot control their challenges and are innate qualities. This is simply an unacceptable approach. My conclusion is I am calling out to Disabled America, and their supporters, to boycott Walt Disney World while they implement this ridiculous idea. I understand the joy it brings to your children, believe me; however, this is bigger than a trip. This is for the people we support. We need to be their voice, and their advocates. Without us they have no one. This is to ensure that they are not expendable as a result of the immature and poor decisions made by those pathetic few, or the “1%.” This is to ensure that Disney understands those with disabilities have needs that they cannot help. This is to ensure that Disney understand the impact of this new policy and the significance of the potential negative repercussions. We need to stick together and really make an impact to where it will hurt Disney the most, in their wallets. I have a 13-year old daughter who has very low-verbal autism, very developmentally delayed. We’re going to Disneyworld in May, and I was disappointed when I started researching it months ago and learned that the disability pass was being discontinued. However, to be fair, at this time one in 36 American kids is being diagnosed with autism (U. of Minnesota study 2013). My daughter has it from reacting to the hep-B vax at birth, given without permission, and it caused encephalitis. The DTaP at 18 months erased her only two words, and she was diagnosed with autism two months later. Autism rates are continuing to go up, mercury is still in most flu vaccines in the full amount, “trace” amounts are still ten times over the hazardous waste limit, and vaccine encephalitis can be caused by any vaccine. The CDC announced one in 88 two years ago, one in fifty last year, and I don’t know if this April’s announcement will reflect the shocking one in 36 figure which blew away the researchers on that study. The vaccine epidemic started in 1988, and we are still seeing its ever-expanding numbers and ramifications. The bottom line is that there are so many now developing autism in reaction to vaccines, that everyone needs to think about what the fair way would be to handle numbers of impatient autistic kids that would have been undreamt of ten years ago, along with NT kids who also deserve a good time at Disneyworld. Absolutely revolting. According to the NY Daily News, the reason Disney rescinded their policy is because too many able bodied people were cheating the system and they could not figure out how else to control it. Does that mean that if a store has a problem with shoplifters, they should stop letting all customers in? Or if a stretch on the highway has a problem with cars speeding, they should just close that section and not allow any cars to drive on it? My situation is different. I am severely disabled-I am an above knee amputee with significant damage on my other leg. I walk very slow and require frequent rests. It takes me a long time to get from ride to ride. I cannot stand for long periods of time due to swelling of my leg and the risk of cellulites. If my family walks with me, then has to wait hours to get on the attraction we would only get to a couple of rides per day. Getting to the front of the line is important for us. Disney has several options it could use. First, they could accept doctor’s notes, which would prove the disability. Second, they could limit the number of able-bodied people that accompany the person with the disability. Simple, right?